RichG - it is possible that this thread was linked to by another forum or site and read widely via links from there. It does raise a number of questions that are definitely on a lot of people's minds I would imagine, due to the popularity increase in sound baths, and the general consensus that "everyone" has a good experience (i.e. even if unpleasant, that they "needed it") is at odds with some people's instincts that the experience was in no way good for them at all. I'd say this kind of cognitive dissonance is what drives people to find answers on such a niche topic. This would get the view count up owing to non-forum members reading it without joining the forum. Anyhow, there are so many variables at play here, where to begin? Already note has been made of the reality that overcrowding, poor quality instruments, or low talent performers can affect the quality of the session - as can ambient noise (especially for outdoor events in larger festivals etc), and even more subtle energies that are hard to pinpoint but are unmistakable. Under this entire umbrella, one would have to point to the evidence suggesting the high degree of care ancient culture put into what often seems to be equivalent to what we are doing today. Frankly, they were much better at it, even with possibly more limited technology. They knew how to create sacred spaces where subtle negative energies were unwelcome, made their instruments with care, took their performance seriously and really listened to the sounds they themselves were making, rather than jumping on a bandwagon because it is popular in some modern niche circle they want to belong to. With all of this addressed, one is left with why someone would have an adverse reaction to a well put together sound therapy session or ceremony. It's not outside the realm of possibility that they are host to an outside entity that is being repulsed by the pure sound energy even while they, if they were alone in their own skin, would be having a positive reaction to it along with everyone else. Don't discount this possibility. Even scientific types come across evidence of such puzzling situations. My approach is to isolate people in these categories and treat them separately. They do not belong in a group activity that assumes it will be a positive experience for all. It's important they know that if they go into a group session and feel this way, they are to escape immediately, but don't just hide their experience, to speak about it with someone who can responsibly handle the situation from there. This is a more niche area that not all sound healing practioners would be able to deal with. Yes, in this case what the person might need is really not that different from an attempt to expulse the negative entity from the person. It requires a different approach, even if it uses similar methologies. The person is going to need to prepare themselves to feel some unpleasant feelings during the process. If they are prepared it will go much better, as they will be fighting on your side instead of wondering what's going on. I'd say more but I am not sure how amenable people here are to such exotic ideas. I don't want to believe what I am saying, as a scientific type I don't like it one bit. But it is the best explanation when all the other variables are controlled for. This is very different from crying or fatigue, which is a kind of middle ground - this can occur after a release of negative energy, as mentioned above, a return to heart space after spending long away from it. Whether that negative energy is one's own, or cast upon them externally, depends how much this kind of situation relates to what I've explained above. The end goal for everyone of biosignal purification (or biotuning) is the same, but some have a much longer road to get there, if they are unlikely, have suffered a lot along their path, or were targeted. I've been to qi gong, there was one hour cristal singing bowls. During Thai qi I could barely move my body sometimes, that's how powerful was the sound of the bowl. At times my gs were trembling, I was hoping I'm not going to fall. It made me relaxed, but also for the next few days I felt tired and pain in my muscles, and feel like crying. After the session my friend and I had few bad fights. Anyone has any thoughts? Sorry I didn't see your post earlier. Are you saying you attended a qigong class and they played crystal bowls for an hour during the class? The responses you had, barely able to move, trembling, afraid of falling, bad fights with your friend etc - NONE of that is a sign of "healing", NONE of that is an affirmative response to the bowls. I would need more details to have any more specific thoughts - but I would stay far away from those bowls and whoever was leading such a class. Can you tell us more specifically about this experience? Where and when was it? Were the bowls recorded or played live? What sort of qigong were you doing? Did other people in the class have problems? I'll say this: there are a lot of people with bowls and gongs who have very little understanding of what they are doing. Yes, I gave my big crystal "chakra" bowl set to a "chakra energy" worker friend years ago, and moved into metal bowls. I think I damaged my hearing with them. Some people are definitely triggered by them. I've been using crystal and tibetan singing bowls for years now. I have not seen the response that this woman talks about, or anything like it. I am wondering, is this the first backlash to sound healing? Are we to be attacked with ill informed, negative propaganda to stop people using this amazing healing modality? for years we used St Johns wart for mild depression. then the drug companies realised that this took a tiny bit of their profit and they started a massive multi million dollar campaign to rubbish the herb and stop people using it. the first two pages of searches now say its dangerous. I'm beginning to think the same of this conversation. I am also shocked that someone would say crystal bowls have damaged their ears. the sound levels are not loud enough. with a gong yes. Lets stop this fear propaganda now. The bowls were played live". It was in Ct state. I dont know about other peoples experience, since people just go after the session, and nobody talks in or after class about the experience. Do they talk in places you know ? Well, when I do my Sound Medicine events I always ask the audience afterward if they have any comments, if everyone is ok, if anyone has any experience they'd like to share. I think it is a very significant part of the experience. As a practitioner offering this sort of energy medicine to a group of people it is my responsibility to check in with everyone and address any concerns someone may have. Thankfully, in my events the responses are nearly always positive - but not always. The Sound can bring up many things, it's not all rainbows and smiley faces! It sounds to me like maybe the person offering the experience you attended is not very experienced or very aware of what they are doing. 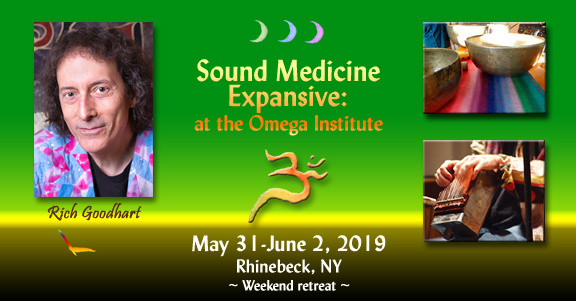 Come to the Omega Institute August 10-12th for my weekend workshop that I will be co-leading with Chloe Goodchild!! You will have the opportunity to experience two highly experienced, reasonably conscious and aware practitioners and teachers! I don't know from what you are reacting from, but it is rather misguided to see this conversation as somehow a "backlash to sound healing" or an "attack with ill informed, negative propaganda..." etc. To characterized anything that has been said in this thread, and specifically to respond to Sinpuka's post as "fear propaganda" is to warrant a bit of reflection on where the ill informed resides. As Sinpuka said, it happened, and they are asking for some awareness about it. We invite and encourage such questioning here. Yes, sound healing is a wonderous healing modality but it is also one not to be practiced with ignorance, insensitivity and misguided information. There are real consequences of poor practice and there are plenty of grossly uninformed people getting into this, usually uninformed through no fault of their own but instead through the fault of "teachers" who should really know better but instead seem only concerned with building their little empires or with monetizing the work for greatest financial return. The fraud, dis-information and irresponsibility in this field is extreme - that is not a backlash, it is awareness - and it's better that we address it from within the sound healing community than it coming from external authorities. And yes, crystal bowls can in fact be damaging to someone's ears. I've personally had to leave rooms where, again, an insensitive and ill-informed "practitioner" was performing. Just using these instruments, and in particular crystal bowls and gongs, with no real understanding, awareness and sensitivity to what one is doing is very much not "sound healing". The large crystal bowls are definitely loud enough to cause hearing damage. I think I can tell if my hearing is damaged or not. And the metal singing bowls are not "Tibetan". Hi, my name is Joshua and I love my mom. I begin and end each sound bath with a couple minutes of silence. I create the intention of peace and calm for each offering and I state that intention at the beginning . Harmony can be found from doing the work and diving into the shadow of dischord but if one is not prepared to do this deep work it can be jarring. I believe that the quickest most gentle way to reach peace and calm is through harmony. Harmony must not be overlooked. Nothing wrong with all 7 bowls but please consider that you have 7 notes of music to then be responsible for if you are trying to be harmonious. But who am I to say how it should or could be? Just like everything else, we are learning and tho the first steps may not always be graceful at least they are first steps and that in and of itself is grace. Thank you for joining the forum and for the kind words in your first post above. It can be quiet around here for long stretches, but there are a lot of good discussions and good information already archived here. Please visit again and feel free to ask questions or share insights! Welcome to the Sound Forum! We've been slow around here lately so please be patient for replies from other members. I have no way to find your deleted post but I do have text of it as I receive email notices of discussions I am participating in..... so, lucky for you, here it is! Hi Everyone, I am grateful to have found you and this forum. I have been experiencing some of the responses that have been mentioned previously. The session was 2-hrs long and divided into segments and different positions. During the first hour we did 3 different Restorative poses. One on the back and two face down 1/2 frogs. I was positioned at the farthest from the gongs and pointed my head towards them. Turning my attention away from these feelings yet honoring their existence I settled into acceptance and chose to get comfortable. I pulled a Goddess card the one for the Arts and music 🎶 surround yourself in music it said🎶 Okay here I am. I followed the usual gently guided Restorative breathing from my Bliss yoga gal accompanied by the Gongs player. I was now turning my attention from the lack to my breathing and gratitude and prosperity. We turned over face down I nto 1/2 supported Frog and then the saddness and racking crying descended. I silently chanted. "I am grateful for my feelings " over and over. Wetting my pillow with tears and my nostrils becoming congested and in fear that if I complete allowed these feelings (as was what I thought I would do if I were alone) I would disturb my neighbor practitioners w/ my sobbing and nasal noises. I hoped it might end when we did the other half of the Frog pose. No such luck. I chose a new chant " I am enough, I have enough, I do enough" and the sobbing etc continued. We were then gently instructed to turn over and assume our favorite Shavassana pose, the crying et al. subsided and I plucked up the courage to borrow a couple of blocks and in a Stonehenge position for the last hour. Afterwards, we were asked if we'd like to share our experience, no one did publicly. We were encouraged several times by Yogi and Gong player to be certain and get grounded before leaving. My yogamat t friend asked how it was. I told her that I sobbed and we hugged. I slowly put my props up and felt tired and hesitant, I shared with another yogina that I had cried hard and she Very authentically said that's good and that I'd probably released something. It seemed she would have liked the experience?? That it was positive. I had decided NOT to chose bad or good. I did want more context. I also told the Gong player and he said that he'd even heard people laugh out loud on occasion. He continued to demonstrate the bowls to a group of us. I hung out played with a bowl. He returned we did not resume our convo. I wandered over to the exit had some homemade sweets and listened, maybe Spirit would enlighten me.. I told my yoga instructor with much the same warm and nonplussed response. I left hoping this was a healing release and practiced acceptance and gentleness and gratitude. Today, I feel, tired, heavy, sadness like grief. So, I sought you all out for some context and care. Thank You for letting me get all that down. And thank you for all of the wisdom and kindness and frankness of this thread. I still don't know if this was how I heal with sound and to rest, drink water and be gently observant. Which I Definitely Will. My Gong response isn't producing the desired response. Or some such other variant on the continuum between. Bless you all and see you all on the mat.